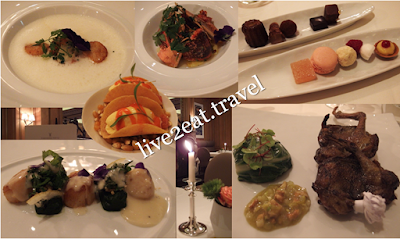 As this was my 1st time dining at a Michelin-starred restaurant, I decided to write my 1st post on an eatery not in Singapore. Planning what to eat when overseas is not part of my itinerary, as I do not want to specially go out of the way in an unfamiliar place looking for an obscure restaurant only for my effort to come to nought because it is closed or the queue is simply too long. However, my travel companion has always wanted to try a Michelin-starred restaurant. The first time we went Europe on a packaged tour, there was limited free time before our guide would bundle us up the bus. And we did not manage to make reservations during our last trip to Paris so this time, we made sure we reserved seats early enough. Fischers Fritz, helmed by Chef de Cuisine Christian Lohse who used to work at 3-Michelin-starred Guy Savoy in Paris and The Dorchester in London, has earned two Michelin stars for the 9th consecutive year. It is conveniently located on the 1st floor of Regent Berlin. 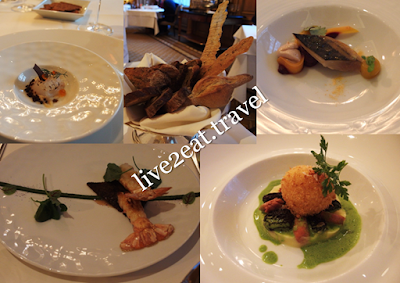 Started with biscuits, followed by two perfectly-executed amuse bouche – codfish with truffle and fish roes, mackerel with cream of goose liver and thinly-sliced yet still crunchy carrot. Breads were lovingly arranged in a basket and served with lightly-salted butter. A pity they were not warmed up, the sour dough was airy but a tad charred and a multigrain slice with seeds and nuts got too chewy towards the end. My dinning companion's appetiser of roasted langoustine was succulent and went well with the salty fake duck skin (by the way, the stem-lookalike in the picture is actually the accompanying sauce of curry kale and sherry vinegar) while my fried onsen egg was served with sot-l'y-laisse and sautéed morsels atop one of the best cream of potato I have tried and comparable with Joël Robuchon's mashed potato. The fragrant wild garlic sauce drizzled on the dish accentuated the taste of the egg, soft-boiled with runny yolks in a crispy thin batter that was light on the palate. Next, my dining companion ordered cream of asparagus with roasted scallops and asparagus salad. I had another appetiser – roasted Altlantic scallops with puree of flat-leafed parsley and shallot verjus. Nothing we could fault on. Main course for my dining companion was Breton lobster roasted with salt, chili and coriander. And I ate charcoal-grilled Breese pigeon served alongside dome of chard with baked celeriac and lukewarm Waldorf vinaigrette. I asked for the meat to be done medium-well and though it was still bloody, the texture was just right (reminiscent of tender duck with crispy and salty skin) and would have been too tough if it was cooked any longer. Full from the food, we decided to give its desserts a miss. From the pastry chef was a sweet, instead of the usual savoury, taco that had corn ice-cream as its filling. Could neither rave about it nor fault the petite fours which included chocolate truffle, raspberry meringue, lemon tart, macaron and sugar-coated orange candy.